• Chaps or Faced Pants? • Barbour, Elitist/Gotta Have One? 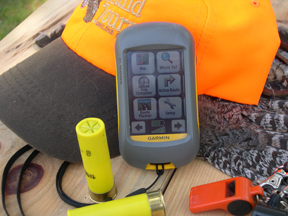 (May 21, 2010) I have been field testing the entry level Garmin Dakota™ 10 handheld GPS and may have finally found the holy grail of GPS’s for the average grouse/bird hunter. I have one of the original Garmin 12 XL’s and the newer Garmin Etrex–both great units but frankly I have to keep a cheat sheet with me because I forget how to operate them when in the field. 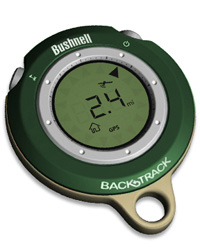 I eventually purchased the Bushnell Backtrack and although the simplicity is great it may be a bit too elementary. The Dakota 10 bridges that gap between overly complicated models and bare bones units. The feature I like most on this Dakota 10 is the touchscreen display navigation. There are no confusing button controls, just large and colorful graphics making it extremely intuitive and simple to use (I never even had to read or look at the paper nor CD instruction manual). This unit is affordable, rugged and compact, and most importantly locks onto satellites quickly under canopy. It has plenty of the advanced features found on more expensive models for those who want them like HotFix satellite prediction, preloaded worldwide basemap, and 850 MB of free internal memory for map transfers. There is a more advanced Dakota 20 model available as well. Ultimately I think of a handheld GPS as a backup to my compass, not the other way around and this unit fits the bill. These can be found for around $250 retail. Info on the Dakota Series of Garmin GPS’s can be found here: GARMIN WEBSITE. (March 2, 2010) I am just wrapping up my third bird-hunting season using the Garmin Astro system; a GPS handheld and collar system that is designed to help hunters keep track of their canine partners, not to mention themselves. Overall, I am extremely happy with the Astro and couldn’t imagine going back to hunting without it. When first using the system I was concerned it would be very complicated, but I was pleasantly surprised that getting the unit up and running to the point of keeping track of the dog was very simple and straightforward. There are many more advanced features that the Astro is capable of, if you are so inclined, but the basic functions of marking your truck’s location and then keeping track of your dog are very intuitive. In general the system is quite accurate and keeps real-time track of the dog. It will show you their distance and direction–updating every few seconds. It will also indicate when they have stopped, with an audio alarm along with a visual indication on the screen of a dog pointing. I would note that the handheld unit needs to be recalibrated frequently, if not the compass arrow that “points” at your dog can become inaccurate, although the distance is always correct. I was pleasantly surprised to find that thick tree cover did not effect the Astro’s ability to acquire a GPS signal, this unit is much better in that regard than previous handheld GPS systems I have used. 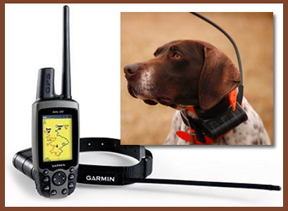 Since the dog’s collar (DC-20 or DC-30) communicates with the handheld unit (220) via radio waves, the effective range is highly dependant on terrain. My unit has maintained the signal of the dog over 1 mile away, but sometimes in broken mountainous terrain the units may lose communication in as little as 300 yards. Luckily if communication is lost, the unit will indicate the last known location of the dog. In my experience if communication is lost at less than a mile it will quickly be reestablished as the hunters and dogs move along. While I have a few minor complaints, like the nylon collar material fraying too easily and the audible point alarm not being as loud as I would like, overall I am extremely happy with the Astro system. It allows me to hunt more quietly and peacefully than before. No longer do I need a beeper or bell on my dog and most importantly it provides great peace of mind that I will not loose my hunting partners with four legs. 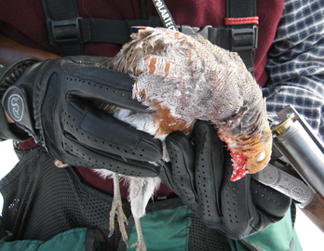 (February 1, 2010) I got my first pair of GripSwell gloves about 6 years ago as a gift from a friend who shoots a lot of sporting clays. He highly recommended them and my initial reaction was that they were an unnecessary luxury, boy, how wrong can a guy be! They have proven to be an essential part of my hunting and shooting equipment. I have had 2 pairs of the GS-1 Palm Swell gloves in natural un-dyed goatskin and received a 3rd pair, black, for Christmas this year. The GripSwell gloves have a pad of memory foam on your trigger hand. This pad absorbs recoil and fills the void where your cupped hand meets the wrist of the stock. I hunt with side by sides, with English stocks and double triggers. I have never had a problem with the gloves and the double triggers. I really like the fit of the gloves and the natural white gloves are relatively cool on hot days early in the season and keep the sweat off your shotgun. I hunt mostly chukars and Huns and the terrain is often quite steep, loaded with lava and difficult to hike in. The gloves protect your hands when you fall (and you will fall if you hunt chukars) and when you are grapping sagebrush to help you descend a hill. My hands stay warm on all but the coldest days and those days I wear a pair of wind proof fleece gloves over the GripSwell gloves. GripSwell makes many different models, some just for side by sides and some that are insulated but so far all I have tried is the GS-1. A word about the dyed gloves, when it’s hot and you sweat, the dye will bleed on your hands. After a few wearings this is minimized but if it gets real hot you may be surprised by how much dye transfers to your hands. GripSwell says it is impossible to have dyed leather that won’t bleed at some point. If this is a problem you can either wash the gloves since they are treated with Scotchgard, or just get the natural white ones. I have tried other makes and these by far the best for fit and durability. (December 29, 2009) I have field tested this Backtrack throughout the 2009 hunting seasons here in Maine. (I also have a Garmin Etrex GPS which I like very much–but I have to keep a cheat sheet in its case to relearn how to use it whenever I need it.) In contrast this Bushnell Backtrack is the epitome of simplicity. You mark a location (truck, camp, deer stand etc), go hunting, decide to head back, turn it on, and it shows you how far you are from your destination and an arrow leads you back–adjusting distance as you go. With my Garmin Etrex I usually turn it on to get a bearing to my destination, turn it off and use a conventional compass, and repeat if needed. The Backtrack doesn't show you the bearing on the navigation/arrow screen (which it should I think) but there is a digital compass feature where you can hold the device in the direction of your destination and get the bearing. The arrow takes a little getting used to, and I find it best to move a little when first striking out–to get the location arrow to settle in the correct direction. I then turn it off and head out, turning it back on occasionally to check my direction and to check distance. It takes about 2 minutes to lock onto Satelites when first turned on and I have found it able to lock on under canopy and cloudy skies. My original batteries still show a full charge. These can be found for under $70 retail. (December 29, 2009) I have been using the MOTHER Day Pack for several seasons now. It is extremely well made and thoughtfully designed. The key is that it is designed to be worn like a backpack with weight riding on the hips via a substantial padded hip belt. This eliminates the fatigued lower back I experience with conventional vests and even strap vests.There are many features that I dont need for the quick cover hopping I tend to do for grouse and woodcock "out my back door" but always take my Day Pack if hunting away from home for several days or more. This is the perfect bird hunting vest for Western hunts or backcountry adventures or those who like to carry all sots of gadgets and gear. MOTHER listens to its customers and have streamlind the design, added larger front/shell pockets and a larger expandable game bag for V 2.0. There is some concern on whether the padded shoulder straps impede gun mount. I havent found the straps to be a problem. The vest is designed with a strap/clip high on the chest and if properly clinched holds the straps inward allowing a solid gun mount. I also own the "Light" MOTHER vest. A simpler version of the Day Pack but with the same thoughful design. 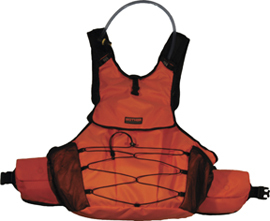 This vest is well suited for shorter hunts not requiring a lot of gear.